The feast of St. Joseph, which is March 19th, is usually celebrated with a Sicilian pastry called the Zeppoli or just St. Joseph cake. 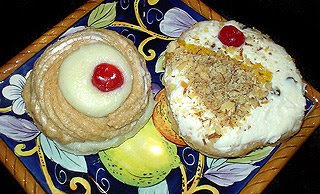 Zeppoli's are deep fried balls of dough hollowed out and filled with either vanilla custard or ricotta cream. My personal favorite is the ricotta cream which is the same filling in a cannoli. Growing up in South Philadelphia we always got our St. Joseph cakes from Termini Brothers. Although they started selling them at the beginning of March it was tradition in our house to have them on St. Joseph's Day. That's not saying we didn't have them several other times during the month of March.